I borrowed How to Vote Progressive in Australia from the library because I was puzzled by the results I got on the ABC’s Vote Compass survey. For the last two elections, ABC Online has offered a survey where voters respond to questions about their policy beliefs – and Vote Compass aligns those beliefs with the policy positions of the three main parties and tells the voter which party best represents their point of view. Both times I’ve done this I’ve ended up with a party I didn’t want to vote for. Both times I rejected the results. The title of this collection of essays is a bit misleading: How to Vote Progressive in Australia doesn’t really help to answer the question. But what it does do is to clarify the situation for the bemused voter who doesn’t understand why the Greens and Labor are at each other’s throats, it charts the rise of the Greens and in an especially cogent essay by Carmen Lawrence it clarifies what we might mean by ‘progressive’ anyway. So, these two parties are not likely to be best friends any time soon, especially not while the ALP has to divert resources to fighting off challenges in inner city urban seats. The essays by born-again Green, ALP and micro-party supporters describing their personal journeys of disillusionment are instructive too. For all of them, political allegiance is a question of integrity. Yet as Carmen Lawrence points out, for most Australians disillusionment with modern politics in a globalised world has led to disdain for politicians leading either to disengagement altogether or a preference for bypassing political parties to achieve goals. Which might be why it looks as if there is going to be a plethora of single-issue Senators in the new parliament. Wilson also suggests what might be a seismic shift in Australian politics: a weakening of ties between the union movement and the ALP such that an alliance between the unions and the Greens might form. It makes sense, he says because union density remains strong in the public sector and the welfare sector – teachers, nurses, public servants, university lecturers (of which he is one) and these workers are potential Green constituencies. One of the last essays (by Peter Van Olselen) looks at the question of Malcolm Turnbull as a progressive alternative within the Liberal Party. It looks like the voters of Australia have passed judgement on that! Title: How to Vote Progressive in Australia, Labor or Green? 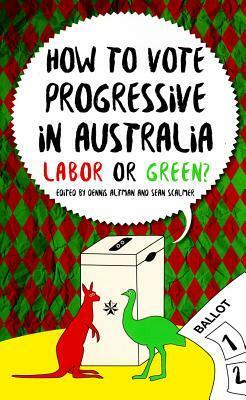 Available from Fishpond: How to Vote Progressive in Australia: Labor or Green? I think that what has happened is that as the socially conservative DLP types have been reabsorbed back into the ALP (via right wing unions like the shoppies), ‘progressives’ and the people who naturally vote for them have moved out to the Greens. Personally, I don’t think there is any chance of this process being reversed. People like me who are naturally from the Socialist Left of the ALP have been protest voting via the Greens for years. Good point: unless I missed it, I don’t think the book addresses protest voting. Elections almost make my head explode. I try so hard to make my vote count but it is becoming increasingly difficult. I’m beginning to wonder if I’d do just as well to throw darts at the paper and vote accordingly. Ah, but making your vote count doesn’t necessarily mean your candidate wins. I’ve almost always lived in marginal seats that change hands every now and again, but even if I lived in a safe seat my vote would still count, no matter which party I voted for. When you’ve lived in a country that doesn’t have democracy, as I once did, you realise that every vote counts, no matter what the result might be. I found this review enlightening, thanks, Lisa, though I have to agree with Karenlee’s sentiments. LOL It makes me feel like starting up my own party… I’m thinking of calling it the Just Let Me Run The Country For A Day And I’ll Fix It Party.